This year our Epiphany celebrations were pretty low-key, although I did spend a couple days making a really gorgeous galette des rois for our dessert. Even though we didn’t have a big event or anything to write that much about both the glaze for the ham and the dessert featured locally foraged sumac that I gathered in the summer it seemed appropriate to write something up about them. This is “A Forager’s Home”, after all! I am also super happy with how the galette turned out, so even though you wouldn’t be able to make it in time for Epiphany this year, I highly recommend that you try it out sometime for some different event! My home processed sumac powder. Sumac grows everywhere in my neighbourhood. It is native to North America, and loves a dry environment, so a lot of people here have used it in the landscaping. If you can’t find some wild, you might see some in a neighbour’s yard and they probably won’t mind sharing a few of the bright red cones with you. Just make sure you ask permission for any foraging you’re doing on private property! There are lots of tutorials online for how to process your own sumac, but I’ve found the easiest way is to dry the drupes, and then pulse them in a blender (this removes the berries from the large, very hard seeds), and then sift the red powder out from the larger pieces leftover. For this recipe you can just use the whole berry clusters submerged in water rather than going through the trouble of grinding them, or you can do what I did - pulse the water and drupes together so they will infuse to their fullest potential. Epiphany dinner this year was ham, mashed potatoes, roasted veggies (roasted in the pan underneath the ham for maximum deliciousness), and Brussels sprouts (roasted with olive oil, balsamic vinegar, and dried cranberries). The dinner was delicious, although the cut of ham we had was a little difficult to work with. I love the quality of the pork we received from our friends’ farm, but the butcher seemed to do some interesting things to it. There was a lot of connective tissue in the middle of what was labelled a “bone in ham” (note the conspicuous lack of a bone). I’m not sure if this was just because one large ham was portioned into smaller roasts, or because it was actually boned, and that this was the result. Either way I was disappointed not to have the bone to do a split pea soup with afterward, but sometimes that’s how things go. I am happy to report that the honey glaze I wrote about a few days ago worked perfectly on this ham. I used Jaime Oliver’s method of poaching the ham first, and then finishing it in the oven. I think it turned out fairly nicely although I’m not sure if the poaching was necessary or not. I may have left it in the oven too long afterward because some of it was a bit on the dry side. However, I am planning on using the poaching liquid to use as soup stock now since I don’t have a bone in this ham to make any with. Sumac drupes infusing in water. Such a beautiful colour! The main thing I wanted to share in this post was the recipe for the galette. You can use store-bought or make your own puff pastry. I recently did a workshop at Blue Bunch Farm on making laminated pastry, so I thought I’d give it a go making my own. I am really pleased with the result, although I am sure it doesn’t look terribly professional. I have to say that now that I understand the process of making puff pastry it isn’t as intimidating as it seemed, and if you’re interested in giving it a shot I’d say go for it! My pastry has a really rich colour and flavour because I used GRAIN Red Spring Wheat Sifted flour. I started it all by infusing some sumac drupes in water overnight in the fridge (you can also use ground sumac you purchased for this infusion - just try googling a recipe for “sumac tea”, or do a bit of experimenting to get the right ratio of sumac to water). The resulting liquid was such a gorgeous colour I was immediately excited to make it into a curd for the galette. Sumac has a tangy, fruity flavour reminiscent in some ways of citrus. To turn the sumac liquid into a curd, you follow the basic process for making a lemon curd. Combine the sugar and eggs, add them into the sumac liquid in a double boiler, and cook it gently - stirring constantly - until thick. Add a few pats of unsalted butter at the very end (optional if you need to be dairy free - this is just for looks and a bit of texture, but it will still be delicious without) and you’re done! The only downside was that If found once the sumac infusion was heated it lost it’s brilliant red colour and turned sort of brownish. Because I knew I was going to be layering this with frangipane I decided to add some food colouring to make it a bit more visually appealing. I don’t love using artificial colour in my recipes, but we really do eat with our eyes first, and I wanted the two layers to be visually distinct in the finished tart, so I felt it was necessary. If you have strong feelings about it feel free to omit it. It will still taste delicious! For the frangipane, I’m sure my methods weren’t exactly orthodox, but they were effective! I just threw everything together in my Vitamix blender and pureed until it was all smooth. This may not be typical frangipane, but it was delicious, and very smooth. I was happy with the result in the end, so either copy my method, or follow something more traditional. Either will be just perfect. For the puff pastry, I used the recipe I learned from Monika at Blue Bunch Farm during my workshop (I’ll be reviewing my experience with the workshops there in a future post, so if you want more information “watch this space”). I really like making it, and the most difficult part is just the amount of time it takes to put it together. Feel free to use store-bough if you like, but this will taste a whole lot more delicious if you try to find some that uses real butter in their recipe. I also found I had very little problem with the filling escaping my pastry this year. In my previous post about Epiphany you can see the frangipane seeping out the sides of my tart. My finished tart dough was flavourful, and very flaky. I think it has a bit more personality than one made with conventional flour as well since the GRAIN flour I used is sifted, but nothing at all like your standard bleached all purpose flour. It’s not exactly whole wheat, but there is a lot more of the whole grain in the finished product which leads to more flavour. This flour is also milled so freshly that you need to keep it in the fridge or freezer, because it will go rancid at room temperature. It’s beautiful flour and I love working with it. Once you have your pastry and your fillings, cut in a circular shape, spread a layer of frangipane, and then cover that with a layer of sumac curd. Put the top layer of pastry over everything and crimp the edges tightly so that none of your filling escapes. Make surface level slits in a pattern you like on top, and brush with an egg wash. I also sprinkled some sugar over the top just to make it all a little more special and delicious. Galette des rois! Put one whole almond in the filling if you want to be really traditional. Whoever finds it in their piece wins a special prize! Takes Several Hours , serves 1 tart. To make the curd, whisk the egg yolks into the sugar, and then combine with the sumac infused water. Cook in a double boiler until mixture is thick and coats the back of a spoon. You should be able to see trace lines when you draw your spoon/whisk through while stirring. Remove from heat and stir in butter. Push through a fine mesh sieve just in case some of the egg didn’t cook perfectly. Combine all the frangipane ingredients in a high powered blender or food processor, and blend on high until smooth. Alternatively whip the butter and sugar together in a mixer until thick and creamy and you can see no sugar crystals. Add the egg and emulsify, and then stir in the vanilla and ground almonds. Beat the mixture until thick, creamy, and homogenous. Roll out your puff pastry according to your recipe’s instructions and cut two circles. I used an 8 inch cake tin as a pattern to trace. Spread a thick layer of frangipane, leaving a little bit uncovered around the edges. Cover that layer with a layer of sumac curd, and then cover with the other circle of pastry. Crimp edges so that no filling will escape. Bake in a 425 degree Fahrenheit oven for about 5-10 minutes until the pastry has started to colour. At this point turn the temperature down to 375 degrees, and continue baking for roughly 20 more minutes, or until your pastry is obviously puffed, golden, and fully cooked. A view of the Christmas tree and my 30 week baby bump. I’m not sure if you know, but we are still in the middle of what was traditionally the Christmas season! I believe today specifically is the 10th day of Christmas, and while I’m not expecting to receive ten lords-a-leaping today I’m still enjoying my Christmas tree, and soaking up a little more holiday season. It seems right to me to continue a little longer since it only just started snowing around here and the tree and other wintery decorations seem appropriate. I do have to say that our new place is so small that a small part of me is looking forward to getting the square footage back in my living room that the tree is taking up right now. The 12 days of Christmas all lead up to Epiphany, and while that isn’t part of how my family traditionally celebrates the holidays it seemed like a really nice thing to add to our celebrations and a nice way to cap off the season. We’ve got our Epiphany dinner set for Sunday and I’ll be making a ham. I thought I’d share the recipe I used for the glaze today. Feel free to adjust this to whatever flavours you like. I you don’t have something or don’t like a flavour go ahead and try something different (and if you do I’d love to hear about it in the comments)! Because the dinner hasn’t actually happened yet I won’t have anything in this post about cooking the actual ham, but I’ll try to remember to take a photo to update this post when I do! Our first time celebrating Epiphany in Kamloops with some dear friends. Read all about it here. For this glaze, I started with the sumac in my mortar and pestle. I’ll be talking more about this ingredient and where I find it in a later post, but for now you should be able to find it in specialty spice shops. I think I’ve been seen ground sumac powder in the spice section of my local Bulk Barn. Sumac berries have a hard seed inside, so I crushed them with my mortar and pestle, until the dried berry surrounding the seed was crushed and sifted that through a fine mesh sieve. Don’t discard the larger bits either - you can steep those in cold water in the fridge overnight and make a lemonade-ish drink. I’d say from one drupe of berries I wound up with about 1/2 a teaspoon of powder, although I could have been more thorough and gotten more out of it. I wasn’t too worried about that though because I’m going to be steeping the larger pieces anyway for another upcoming recipe. After the sumac berries were broken down, I added the other whole spices and continued to crush them. 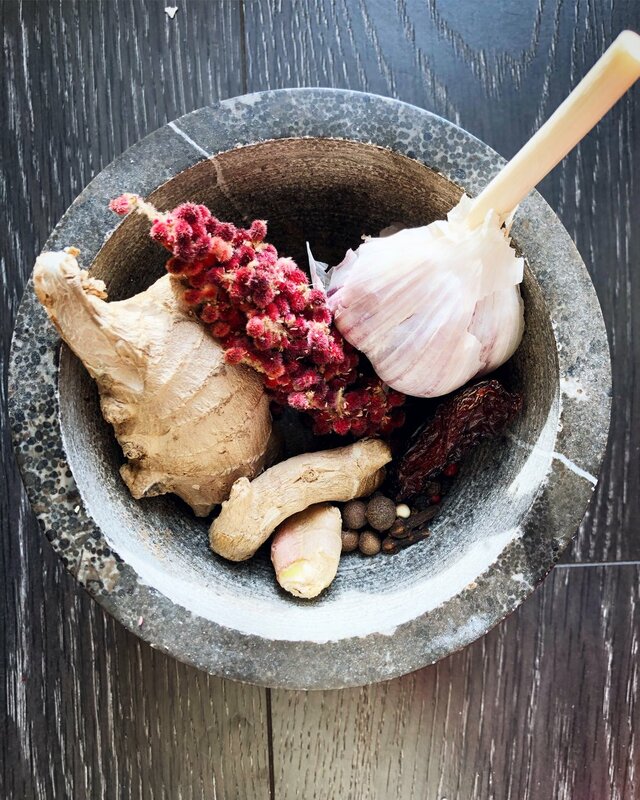 After that I added fresh ginger and a clove of garlic, and continued to grind it in my mortar and pestle until the whole mixture formed a sort of paste. At this point I took it out and mixed it with local honey, nasturtium flower infused white wine vinegar, a little bit of molasses, and salted the mixture to taste. It’s a delightful mixture of tangy, sweet, and warm from all the spices and ginger. Takes 15 minutes , Serves enough glaze for one small ham. If you are using dried sumac berries, pound and grind them in a mortar and pestle or spice grinder until the berries are mostly powder and the hard seeds are all exposed. Sift this mixture and use only the powder for this recipe. Discard or save the larger pieces that don’t make it through the sieve. Add the whole dried spices and chilli to the mortar and pestle along with the sumac powder. Continue grinding until all the pieces are a fine texture and roughly the same size. Add the fresh ginger and garlic one after the other, and continue grinding the mixture together in the mortar and pestle until it all forms a paste. 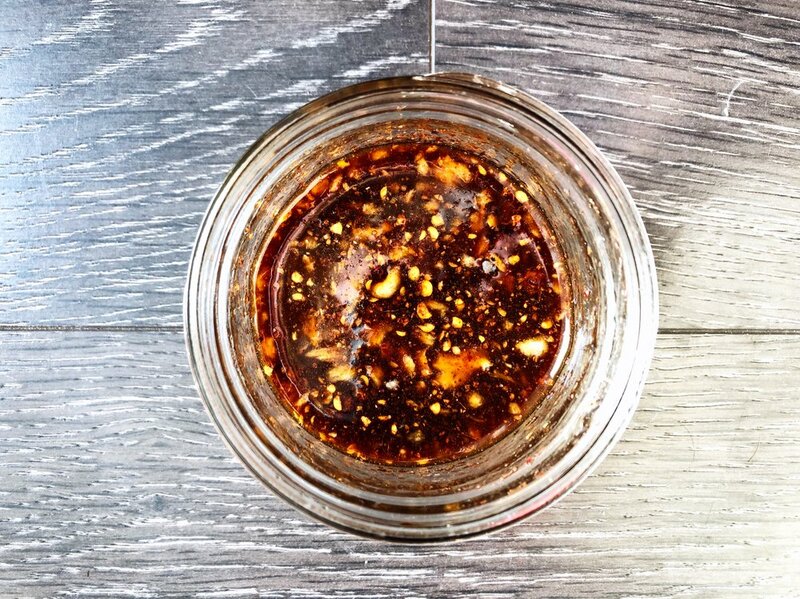 Transfer the paste to a small bowl, and combine with the honey, vinegar, molasses, and salt to taste. Adjust all the spices as necessary - go ahead and grind more of anything that you feel is missing. This is all about adjusting to your own preference, but remember you are making a glaze, so the end result should be rather on the sweet side. You want it to caramelize on the ham in the oven while you are cooking it. If you think you might not have enough for your ham, feel free to scale up the ingredients until you have enough to cover it. Follow your preferred method for roasting your ham, and add this glaze when there are about 30-60 minutes remaining to the cooking time. You want this to caramelize on the outside of the ham, but not to burn. It’s beginning to look at least a little bit like Christmas over here! There isn’t all that much snow compared to the last couple years, and November was unseasonably warm. No matter what the weather is doing Christmas is on its way and I’ve got a great sugar cookie recipe to share with you! Douglas-fir might be a common choice for Christmas trees, but the one behind this plate of cookies is an artificial tree so don’t use this as an example if you’re trying to make a positive ID! Where I live Douglas-fir trees are one of the dominant features in our landscape. You can see a whole bunch of them in the panorama shot below of my old backyard view. Pseudotsuga menzesii aren’t a true fir tree at all, and come in a couple varieties - one coastal, and the other inland. The latter ‘Rocky mountain Douglas-fir’ (or pseudotsuga menziesii var. glauca) is what we typically find in our area. They have a few different features, but their uses are the same. I haven’t had a chance to taste the coastal Douglas-fir, so I can’t comment on the difference, but this recipe could be made with either. The main thing I’ve observed is that the cones are slightly different shapes, and there are a few other differences in the overall growth habit of the trees. There are very few naturally occurring coniferous trees in the BC Interior that are poisonous - and in fact all trees in the family Pinaceae which includes the Douglas-fir are completely edible. The main danger you might come across the Western yew. This is not actually a coniferous tree, but it is an evergreen and is very toxic, so make sure you know what you’re gathering. You can tell it’s yew because of the way the needles connect to the branches, and the little red “berries” called arils that grow on it. These arils themselves are technically edible, but the seed inside them, and the branches they grow on are one of the most toxic substances growing in nature. I don’t say this to scare you off foraging from trees, but rather to encourage caution and that you’ve studied enough to feel confident on your ID. Eat the Weeds has an excellent article about yew that covers much more than I have time for here, and the Provincial Government of BC has a really great online guide to common native trees in this area. The flavoured sugar I made this spring/summer was using the green cones of the Douglas-fir. I really loved the way the sugar turned out, and was already dreaming of making Christmas cookies in the shape of Christmas trees, using actual Christmas trees as one of the ingredients! These are really easy to identify if you’re a little nervous about your tree identification skills. If the cones you’ve gathered look like my photo below you can be fairly confident that you’ve not gathered anything poisonous, but please don’t rely on my photos alone for identification purposes. Pick up a reputable field guide (like the BC Government one I linked to above), and use more than one feature as your basis for identification. Douglas-fir cones have these little bracts that stick out which makes them easy to spot. There is a legend that a little mouse tried to hide in the cones from a forest fire and got stuck there. When the cones are fully dried (like in the wreath I have in my shop) you can see how the bracts look like the hind feet and tails of little mice! This makes them really easy to identify. This sugar cookie recipe is great using the flavoured sugar (and I’m already thinking about making some lilac or rose flavoured ones with the floral sugars I made earlier this summer too), but it would be equally as good as one done with just plain granulated sugar. I also want to go out and try to make some sugar with the mature needles of the tree and see how that tastes. I was kind of hoping that the sugar and the resulting cookies would be greener, but as you can see the outside of the cones were a very light green, and when you cut them open they are white inside, so what I ended up with was a very light coloured sugar that actually turned more yellow in time, and didn’t colour the resulting cookies at all. I also want to do a taste comparison with the mature needles because I think the taste would be stronger, and I want to know if that would be a good thing, or an overpowering thing! Most of the advice you find online about using pine/fir/spruce needles for food is that you usually gather the immature tips in the spring when they are the most tender. If I end up doing a follow up experiment I’ll definitely be posting the results either in a follow-up post, or editing this one to reflect it! As it is, the taste of the fir cones is fairly subtle, but it comes through such a simple recipe like this in a really pleasing way. You aren’t going to raise any eyebrows if you include these on your holiday cookie platter, but they still have a little extra something in their flavour profile that sets them apart from your average sugar cookie. The flavoured sugar when it is fresh tastes almost like a Sour Patch Kids candy - acidic and almost citrusy. This is because Douglas-fir naturally contains a lot of vitamin C. I found that over the months of storage the brightness in the flavour mellows somewhat and you notice more of the resinous tree flavours that were more of a backdrop when the sugar was fresh. Here you can really see the little flecks of Douglas-fir cones in the dough. You don’t need anything special for this recipe, although I highly recommend GRAIN flours. They’re not paying me to say this, but I so appreciate what they are doing, and the quality of the flour they produce. I know exactly which place in Canada (Etzikom, AB) the wheat for my flour was grown in and that makes me very happy. I also like to use a marble rolling pin (because of the weight of it, and because you can throw them in the freezer to make them really cold for rolling out pastry), and I love the shape of this vintage cookie cutter I found in an antique store even if the handle and backing part make it a little tricky to see if you are overlapping your cookies when you cut them. I also found that chilling the dough for this recipe was really important. It helped the flavour from the sugar seep into the dough more, and also helped make it easier for rolling. It ended up being a bit on the sticky side for sugar cookies, so you’ll need to flour your rolling/cutting surface, but try not to add too much or else that’s all your cookies will taste like. Just use the bare minimum to keep things from sticking. Also please note that the temperature in the recipe below is not a typo! I used to think that you were supposed to cook sugar cookies at a hot temperature for a very short time, but my pastry chef friend showed me another way that in my opinion results in a much nicer cookie. You’ll need between 20-25ish minutes per batch in the oven, but it is so worth it in the end for the overall texture so just trust me and give it a try. You’ll also need to rotate the tray in the oven, and what I mean by that is halfway through the baking time (after 10-13 minutes) you’ll pull the tray out and turn it so that the cookies that were in the front of the oven are now in the back. This was another step that no one really taught me before, but it helps ensure the cookies are all baked evenly. Takes 1 hour , serves 5 dozen. Preheat your oven to 250˚F. Cream butter and sugar in mixer until butter is light and fluffy, and no granules of sugar remain. This step is particularly important for these cookies because the homemade flavoured sugars tend to be on the coarser side and you don’t want big sugar crystals in your finished cookies. Add the egg and vanilla and cream until emulsified and the mixture is homogenous. Sift dry ingredients together in a separate bowl, and add slowly to the egg/sugar/butter mixture. Chill dough in the fridge for a minimum of two hours or up to two days. Dust counter with flour roll to 1/4 inch thickness. Cut into desired shapes. You can choose to re-roll the scrap dough as many times as you like but the more you do it the more flour will be incorporated and the quality of the cookies will suffer some, but not to the point of making them less delicious. I chose to use all my dough since my flavoured sugars are a bit precious and I wanted to make as many cookies as possible without wasting. Place on parchment lined baking sheets in preheated 250˚F oven. Bake for 10-13 minutes, rotate cookie sheet so the cookies in the back are now in the front, and bake for another 10-13 minutes until cookies are baked through but have not begun to colour on the edges.